This lesson can be used as a pre-lesson for the Distributive Property lesson plan. Students will be able to apply the distributive property of multiplication. Students will be able to explain the solution to a multiplication problem using partner support and a graphic organizer. Tell students that in math, there are often rules that apply to certain mathematical operations. These rules, or properties, often make it easier for us to solve certain math problems. Inform students that today they will focus on one of these properties called the distributive property for multiplication. Tell students that the word "distribute" means to deal out or hand out something. Give examples of distributing, such as a teacher distributing pencils to students or a coach distributing soccer balls. Ask students to discuss their connections to the concept of distributing with a partner. Read aloud the content and language objectives and have students repeat or rephrase them to a partner. Tell students that they will first review some key vocabulary related to today's lesson. Distribute a copy of the Glossary worksheet to each student and display a teacher copy on the document camera. Call on student volunteers to read aloud each vocabulary term and its definition. Model to students how to draw a visual to help explain the meaning of the word addend (e.g., draw 12 + 23 = 35 and circle the 12 and 23). Have students continue drawing visuals for the remaining vocabulary words. Tell students to share their visuals with a partner, and explain how the drawing gives more meaning to the word. Have a few students share their visuals with the whole class on the document camera. Provide sentence stems/frames to help students share, "I drew ____. This visual helps me to understand the word ____ because..."
Have them glue the Glossary worksheet into their math journal for future reference. Explain to students that the distributive property is useful when we want to multiply larger numbers more easily by decomposing one of the factors into smaller pieces. Reiterate that the distributive property means that we can distribute the multiplication to each of the factors by breaking up one of the factors into more manageable addends. Display the Sweet Distribution worksheet on the document camera. 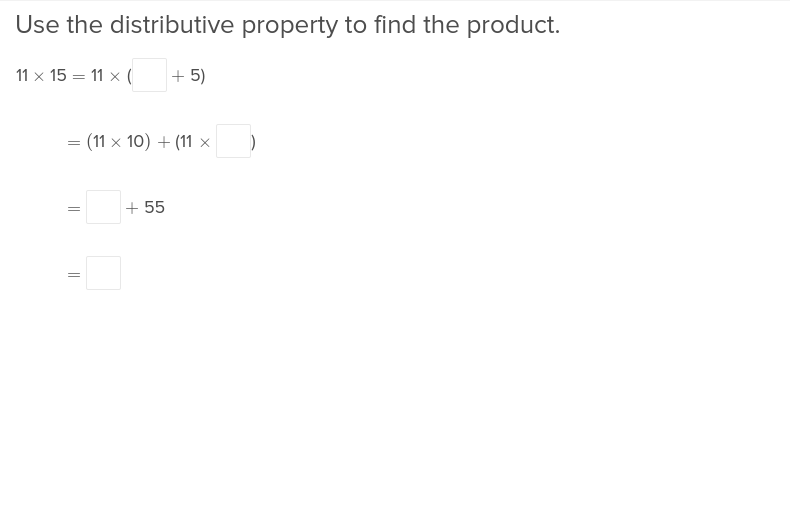 Read the steps to use the distributive property and go over the sample problem. Emphasize the importance of using arrows to demonstrate how you are distributing the factor to each addend. Read aloud the first word problem, defining any tricky words in students' home languages (L1s) and in English (L2). Model how to solve the problem using the distributive property for multiplication. Say, "I know that I need to multiply 18 by 4 because there are 18 members of the team and they each got a four-scoop ice cream sundae. I will decompose the 18 into 10 and 8 to make the multiplication easier. This gives me 4 x (10 + 8) = which becomes (4 x 10) + (4 x 8) = . Then I get 40 + 32 = 72. There will be 72 total scoops of ice cream." Tell students that they will practice multiplying using the distributive property by solving some problems and explaining their reasoning of the process. 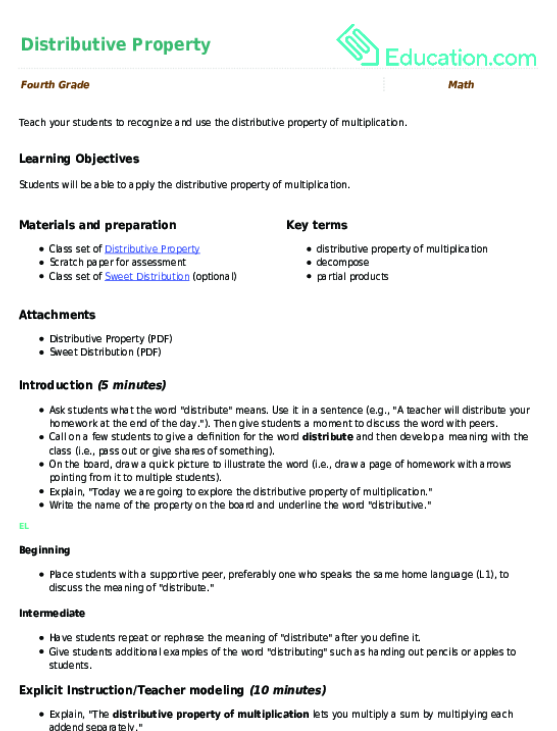 Distribute copies of the Sweet Distribution worksheet to students and have them redo the first problem using your explicit teaching as a guide. Hand out the Refine Your Justification worksheet to each student and read aloud the teaching box. Place students into strategic A-B partnerships (i.e., those with the same home language could be placed together, or a beginning EL could be placed with a supportive intermediate EL). Tell Partner A that they will solve problem 2 while Partner B will solve problem 3 on the worksheet. Tell them to solve their assigned problem on the Sweet Distribution worksheet on their own using the distributive property. Then, write their explanation down in the first section on the graphic organizer. Remind students that for this first explanation they are simply to write down the explanation using whatever terms make sense to them. "First, I decomposed the ____ into ____ and ____." "Then, I distributed the factor ____ and multiplied it by____ and ____." "This gave me the partial products of ____ and ____." "Finally, I added ____ and____ to get ____ as my answer." "I know this part of my solution is true because..."
Have students share their first and second explanation to a friend. Have the students provide feedback to their classmate about their explanations. "I like how you explained that..."
"The part where you wrote ____ helps me understand..."
"I'm not clear about this part. Maybe you could say more about... "
"I think it is helpful to add..."
After both Partner A and B have given their feedback to their classmate, give students time to rewrite their explanation a final time, this time with a focus on the why their solution is correct. Tell students to imagine they are explaining the problem and solution to a person that does not have experience with the distributive property for multiplication. Remind them to use evidence such as drawings, examples, step-by-step math work, and complete sentences in this last and most thorough explanation. Have students read their third explanation to their partner. Invite a few students to read aloud their final explanation to the whole group. Celebrate the accuracy and use of evidence in their explanations. Read aloud the word problems to students during the Guided and Group work time. Define any unclear words from the word problem. Allow students to explain the process of solving the problems in their home language (L1) before rephrasing (using sentence stems/frames) in English. 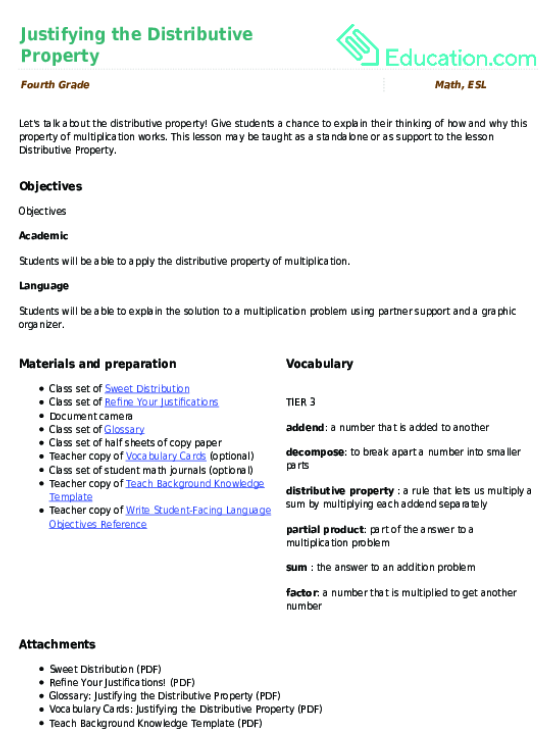 Distribute a half sheet of copy paper to each student and have them write an explanation of the "distributive property of multiplication." Instruct them to include the term, a definition in their own words, an example, and visuals to help explain the property. Have students share their assessment with a partner. Invite a few students to share their sheet with the whole class. Congratulate students on their in-depth work to understand and explain the meaning of the distributive property.